Car # 991225 has a new home! Goodbye birds and rodents - hello new home in Hickory Corners Michigan. 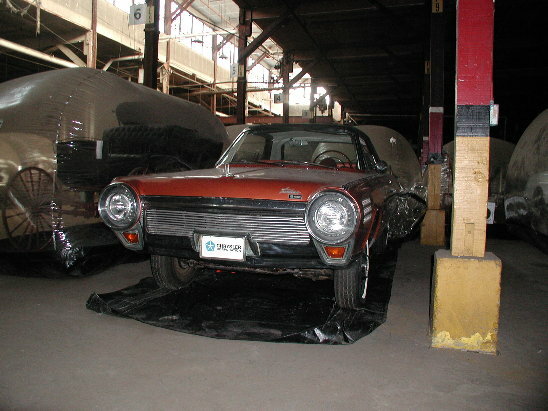 The Gilmore Museum located in South West Michigan has aquired the Detroit Historical Museum Turbine Car. I was informed of this today, March 22, 2006 by the Executive Director, Michael Spezia. He wants to use the sound of our car as part of the new display - I have provide that and hope to be able to supply photos etc. for that display. For those of you who don't know where the Gilmore Museum is, here is a map from their site. The Gilmore Museum began in 1963 (so did the turbine car) as the hobby of Donald S. Gilmore. He first restored a 1920 Pierce-Arrow which his wife gave him for a birthday present. His wife later (after Donald collected 30 more cars) suggested he start a museum. Donald passed away in 1979 and his wife in 1990 bu the legacy they began is still growing! To find out the complete story - Click on this link! Or read the Press release below it tells the story of the museum. 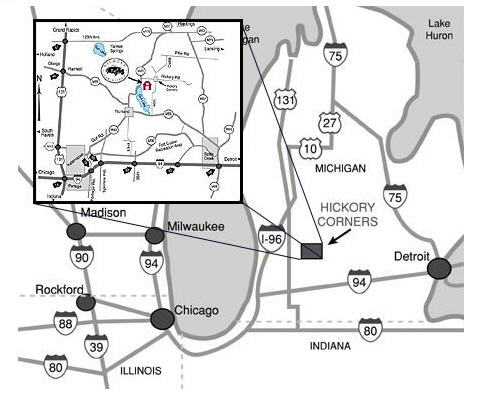 In the heart of southwest Michigan a truly remarkable experience in automotive history is waiting to be discovered - by you! Dreams of finding an "old car in a barn" are a daily reality here. Nestled on 90 landscaped acres in restored historic barns are over 175 extraordinary vehicles spanning more than 100 years of automotive heritage. Here you will find exhibits ranging from a 1899 Locomobile, to the classic Duesenberg or the elusive Tucker '48, and from the Model T to the muscle cars of the 60s. The Gilmore Car Museum has been a popular destination, both for families and diehard automotive enthusiast, since opening to the public in 1966. It has been hailed as one of the finest automotive museums in the nation and was recently selected as one of the "must see auto collections in the world" by The FINE LIVING NETWORK, a cable network owned by THE HOME & GARDEN CHANNEL. One unique feature that sets the Gilmore Car Museum apart is its long-standing partnerships with other museums. It is common for museums from across the country to cooperate with each other and even share exhibits from time to time. While it isn't common to find two renowned museums in one location that is exactly what you'll find at The Gilmore - four museums! This rural sanctuary is home of the Classic Car Club of America Museum, The Pierce-Arrow Foundation Museum and the Tucker Historical Collection and Library, and the ever growing collections of the Gilmore Car Museum. Orphan cars, those automobiles that are no longer manufactured, seem to hold a special place at the Gilmore. Started as the hobby of one man, Donald S. Gilmore, when in 1963 his wife gave him his own orphan for his birthday- a 1920 Pierce-Arrow project car . Within three years his collection had grown to over 30 automobiles, he had purchased 90 acres of farm property and had several historic barns dismantled piece by piece and moved to the site.In July of 1966 Gilmore and his wife Genevieve established a non-profit foundation so that future generations could enjoy the collection. Donald Gilmore passed away in 1979 but the legacy that he began continues to grow today. s largest displays of automotive hood ornaments and name badges can also be found in the combined collections of The Gilmore and CCCA museums. Plans to establish the Classic Car Club of America's museum at The Gilmore first germinated in 1984, and by 1987 "Barrett Barn" was dedicated. The structure, dating from the 1890s, was disassembled, relocated and reassembled at The Gilmore site and serves as exhibit space as well as a library. The planned addition of a 5,500-square-foot octagonal barn will nearly double the space dedicated to the display "Full Classic" automobiles. Representing the pinnacle of engineering, styling and design for their era, these cars were typically built in limited production numbers between 1925 and 1948. Famed orphans such as Auburn, Cord, Duesengberg, Wills St. Clair, Stutz, and Packard are just a few that are exhibited in the CCCA Museum. The CCCA Museum "Experience" is an annual Concours event that takes place the first Sunday in June, and this year features all Packards and full classics. The Pierce-Arrow Society established it's museum on the grounds of The Gilmore three years ago and currently displays a wide array of Pierce-Arrows, including a 1912 motorcycle. The Pierce-Arrow Motorcar Company actually began as a manufacturer of birdcages, iceboxes and other household items following the Civil War. By 1896, they began producing bicycles, and within five years, had entered into the motorcycle and automotive fields and continued until 1938. The luxury automaker had a rich history from its many automotive innovations, a strong racing legacy, and finally, to its merger with Studebaker in 1928. A permanent exhibit featuring the museum's 1948 Tucker traces the short history of the Tucker Corporation and Preston Tucker's "Car of the Future." The radically designed Tucker still draws attention today with its rear-mounted helicopter engine, pop-out safety windshield and center headlight which turns with the steering wheel. The Tucker Automobile Club of America established the Tucker Historical Collection and Library at The Gilmore in 2000 as the national repository of the Tucker Archives. Guest can peer into a faithfully re-created 1940's Tucker Sales Office, reminiscent of what you may have found at Tucker Corporation or at one of its dealers nationwide. You may just imagine that Preston Tucker has just left, possibly to go down to the Engineering or Sales Departments to check on his project. In the "showroom" exhibit, you can locate the dealer nearest you and "place your order today"! During the third weekend in June the Gilmore Car Museum will become part of the national Tucker convention's "Grand Celebration." Currently, four restored Tucker automobiles, nearly 10% of total production, and noted author and Tucker employee Phil Egan, are anticipated to be on hand for the event. *"A Question of Power" Gas, Steam, or Electric?- What would have been your choice of these early modes of power? *"100 Years of FORD" - Henry Ford and the Model T reshaped the way we live&but it didn't stop there. *"Hudson: From Beginning to End" -hailed as the most complete collection of Hudson automobiles exhibited anywhere in the world is on loan from the Hostetler Collection of Middlebury, IN. *"Made In Kalamazoo" - The automobiles Kalamazoo was once known for, such as the Checker, Roamer, Hadley-Knight and Michigan. The Gilmore Car Museum's "Waltz Blue" Tucker '48 is the 47th of only 51 produced and shows only 35 actual miles on the odometer. CCCA.jpg is one of our many events with one of our barns in the background."